While we laud the holding of the Christ the King procession, I kept scratching my head after seeing this. Church law and tradition is very specific on what to do during Christ the King. And it is having a Eucharistic procession. 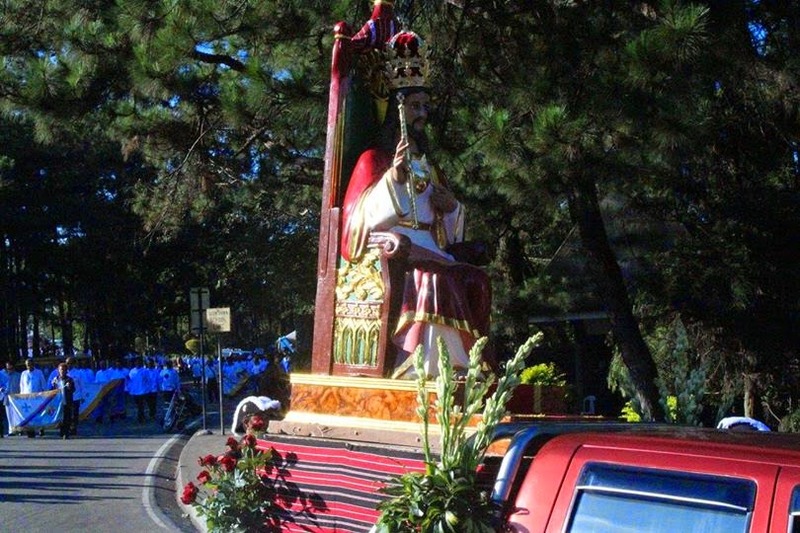 Not a procession of the image of Christ the King. 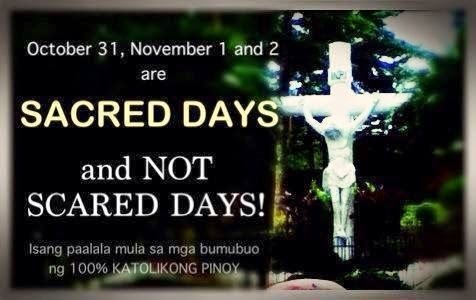 Maybe we can correct this next time huh, Diocese of Baguio? This is the artists rendition of that agricultural land wasted by an ambitious project of the Mormon Church copycat called Iglesia ni Cristo which is actually Iglesia ni Cristo sa turo ni Manalo. Wonder why that place was called Ciudad de Victoria? It is Spanish for City of Victory or in Tagalog, Lungsod ng Tagumpay. So what's with the victory thing? Well, for one, the INC is trying desperately hard to gain more members into their flock to bolster their coffers more than saving souls, even sending entire families to migrate to other countries or telling their women to tell their non-INC suitors to either convert or get someone else. The founder of this uber secret, uber rich sect was born Felix Manalo Ysagun. 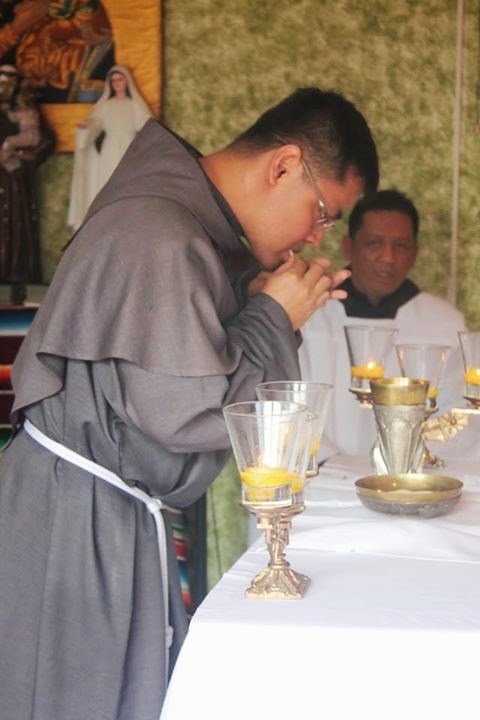 He decided to have his name legally changed to Felix Manalo because of what he might have perceived as a "sign" and a "prophecy" of his "anointing as a "last days prophet". (Last days! Ha! He is succeeded by his son then his grandson and the last days have long been well....late!) So, taking his name Felix which in Latin means Happy and his new surname Manalo which Tagalog means Victory, he took it as his mission's ordination, a sign of a happy victory for his new found sect. Fast forward into a ho-hum centennial, and an ambitious real estate project which is being sold to INC members, (you know how they "sell" things there), they names the place Ciudad de Victoria. But what they forgot, for all their fantasies about Victory and Triump is that Victoria is actually the name of the Roman goddess of victory, her greek counterpart being Nike. So, the Roman Catholic Church hating sect inadvertently or foolishly named their place after a Roman goddess, a pagan deity. 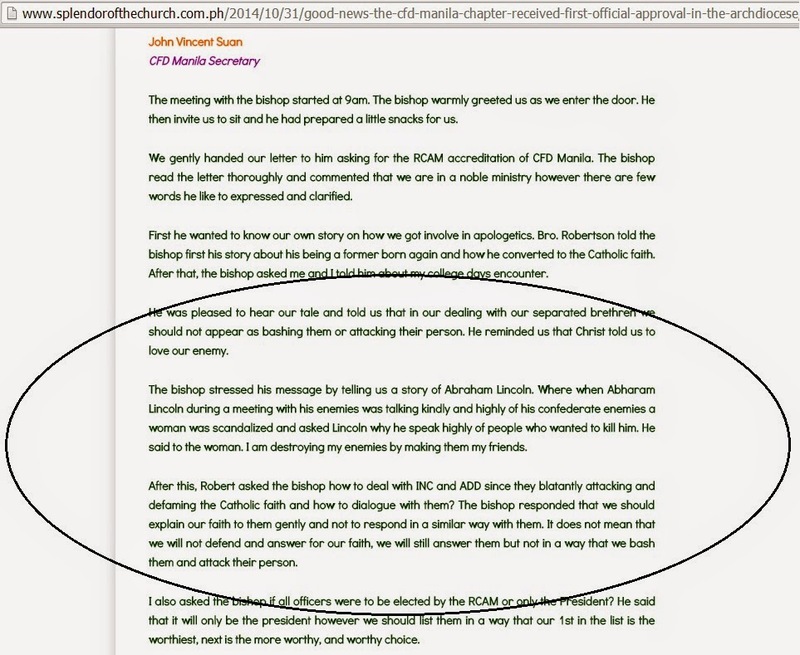 And the INC claims they cleansed the Roman Catholic Church of all pagan influences. Composed by Fr. 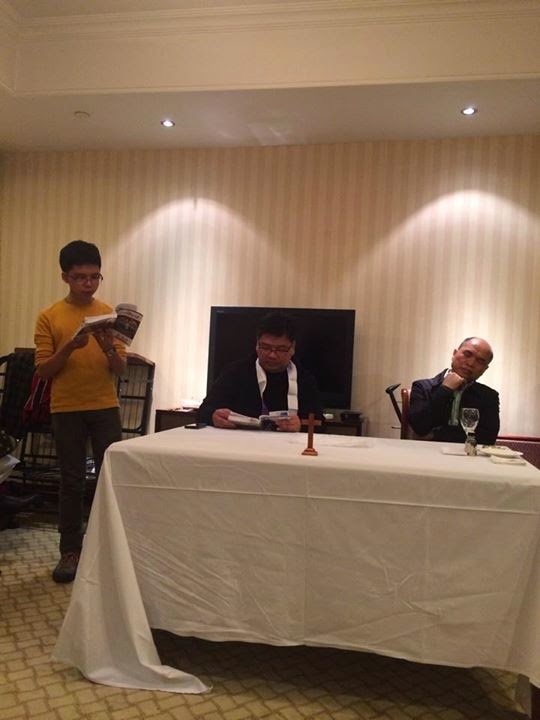 Manoling Francisco, SJ now being sung in Catholic churches in the Archdiocese of Manila. I heard it sung at Edsa Shrine this Sunday. Lasted for almost 10 minutes! That beat your usual Gregorian chant, Missa de Angelis Gloria which only runs for 3:20! The antiphon is in English, Latin, Bisaya, Tagalog and Ilocano. Three verses. 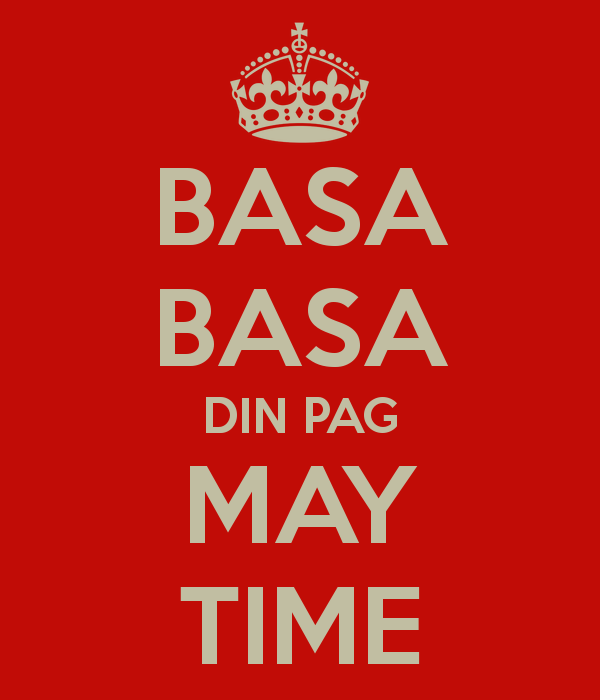 First in Ilocano, next in Tagalog, and then the last one in Cebuano. So if you are like most of Filipinos here in Manila, chances are you will only understand two out of five languages/dialects used. Which makes you scratch your head. Why not just English? Why not just Tagalog? Why not just Latin? So the liturgists of the Archdiocese will spend time asking the people to learn this new song while deriding the centuries old Gregorian chant? Tell me. Is this what San Beda and PIL taught you?...........to despise anything from the past just because they are old? Latin is hard to learn? Tell it to these youths. Tell that to the Muslims. Young people already chant and read Arabic....I mean young FILIPINO people. 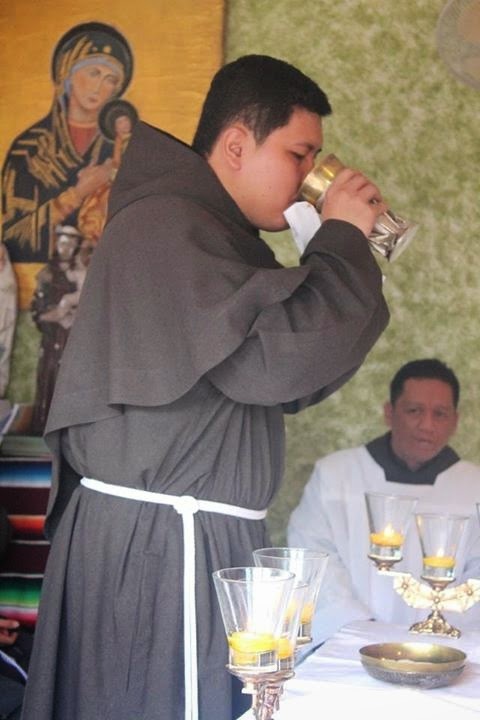 PS: I saw photos of a young seminarian serving the Beatification Mass of Lorenzo Ruiz and companion martyrs at Luneta. That seminarian is now a cathedral rector and the other one is an archbishop. Why'd I say this? Simple. 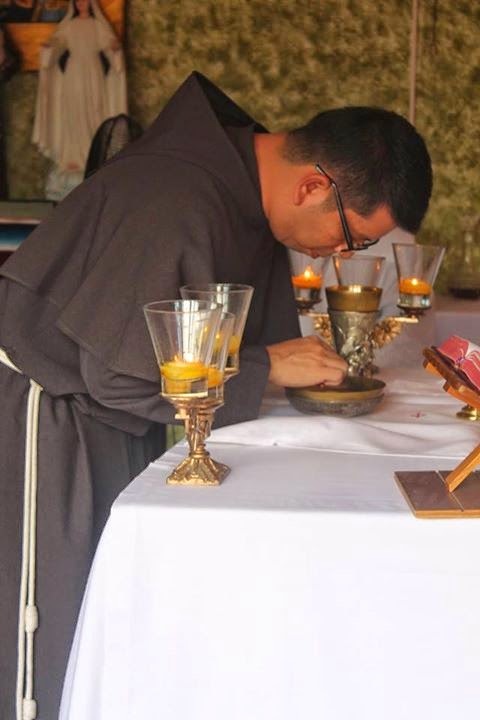 Professional Lay Liturgists especially the one from Cubao would love to take the spotlight even from seminarians. 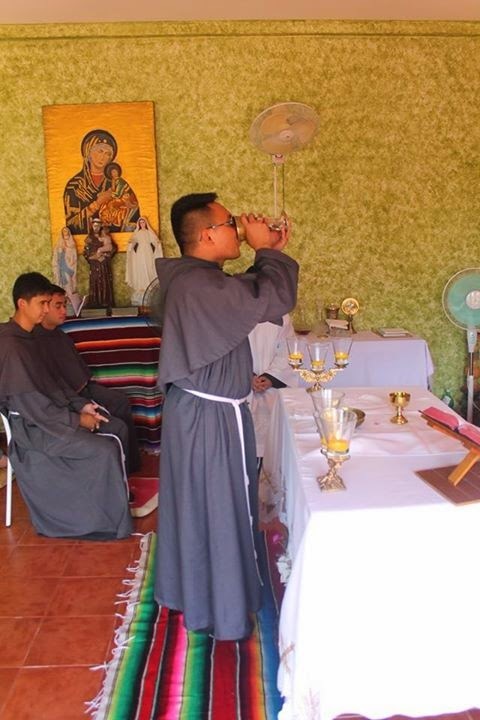 Why not enter the seminary instead of being a perpetual altar server. Let me give you a hint. FLUNKED. REJECT. 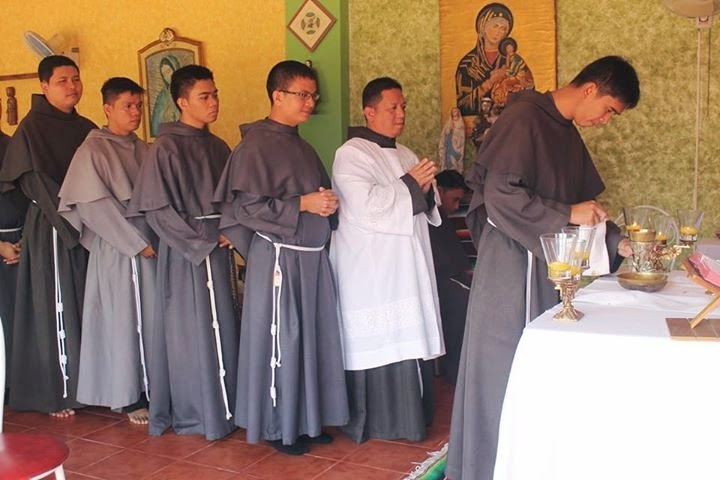 I mean, these are NOT Pink Sisters but Altar Servers at the Installation Mass of Fr Mar Lucas of Holy Family Parish, Brgy Catmon, Sta Maria, Diocese of Malolos. 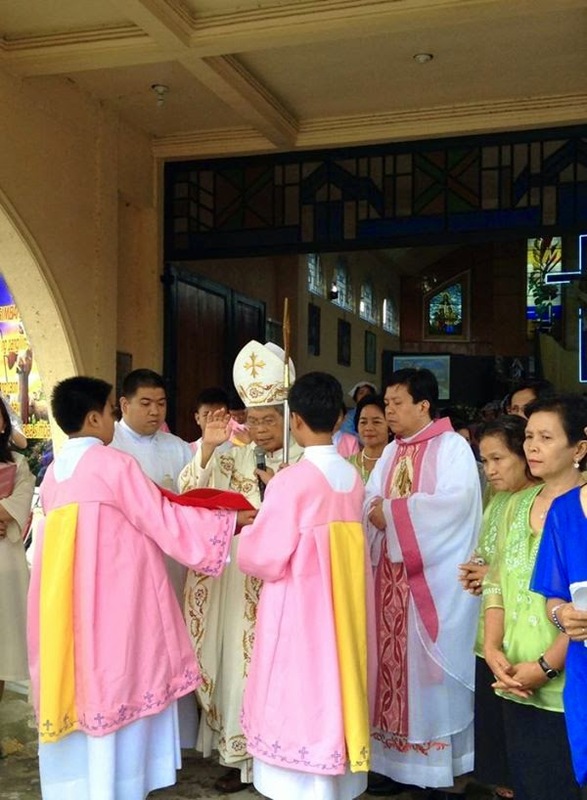 Where in the world did the Church ever had a PINK surplice? And what's that yellow stripe? Maybe a poor version of a strawberry shortcake with lemon strips? 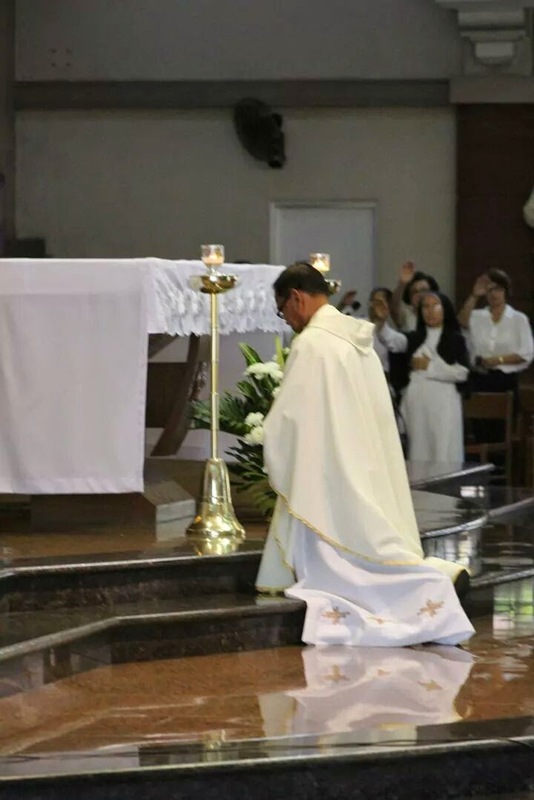 Click this link and this link, where this blog has written extensively about the surplice and how this has been GULPed, meaning liturgical abuses and creative nonsense of the colors and design of the surplice is happening here in the Philippines. May I repeat for the nth time. Church vesture has meaning. They are not to liberally played with even if you blabber around that you graduated from PIL or San Beda, because quite frankly and TPCesque bluntess....nobody cares if you came from those two schools. And the books will prove that! 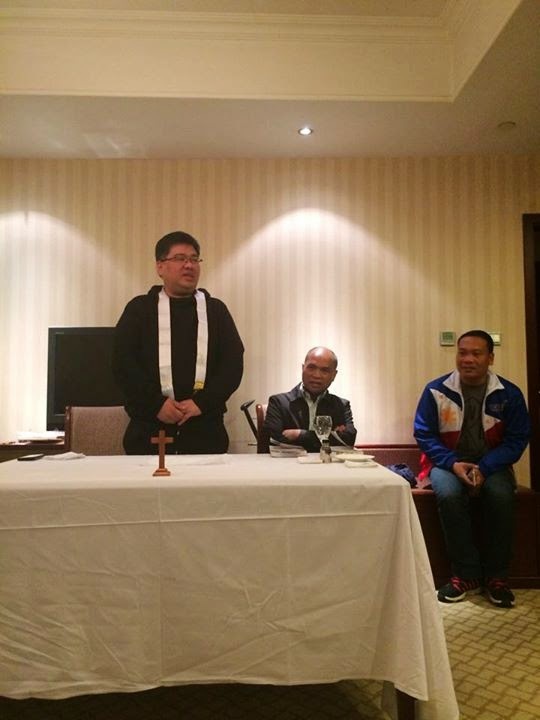 PS: Are you going to wear those when the Pope comes to the Philippines in January 2015? In street clothes with just a stole. Ordinary glass goblet for a chalice. No candles. Absence of Lectionary and Evangelarium. No Sacramentary. 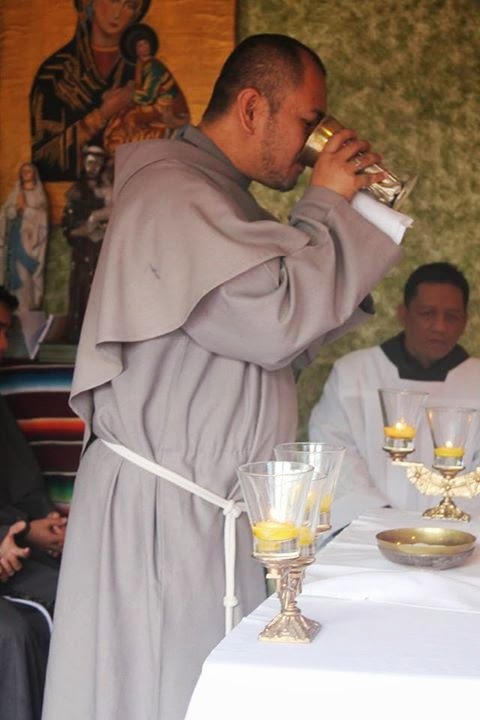 RCAM Fathers, ito ba ang turo sa inyo ng world-renowned liturgists ng Archdiocese? Basta mabuti ang intention kahit ano pwede na? 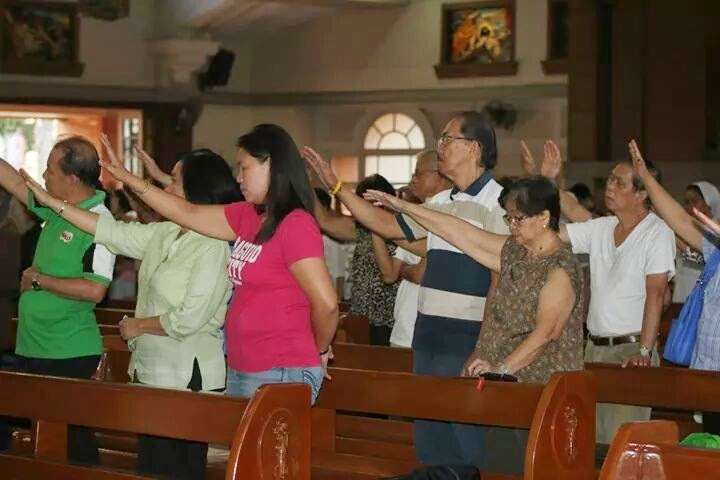 You expect the faithful to show respect to the Mass pero you yourselves do not give the Mass the respect it deserves. 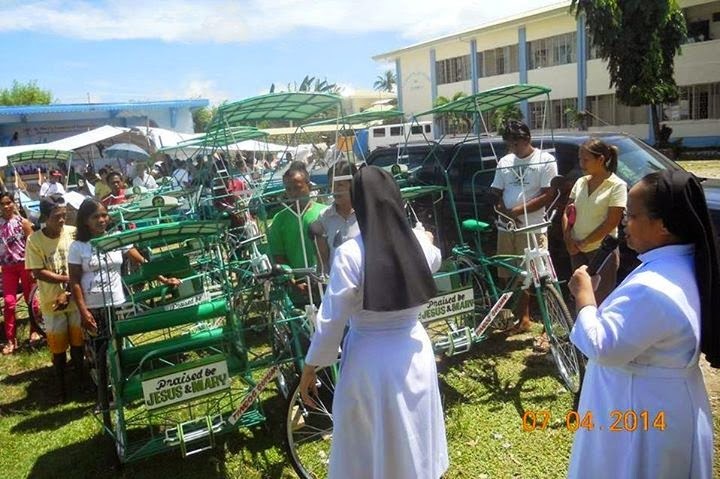 Taken at ST. MARY'S ACADEMY of GUIUAN in Eastern Samar during the blessing of pedicabs given to families affected by supertyphoon "Yolanda". Susme, si Sister naglaro ng pari-parian at nag bless ng pedicabs. 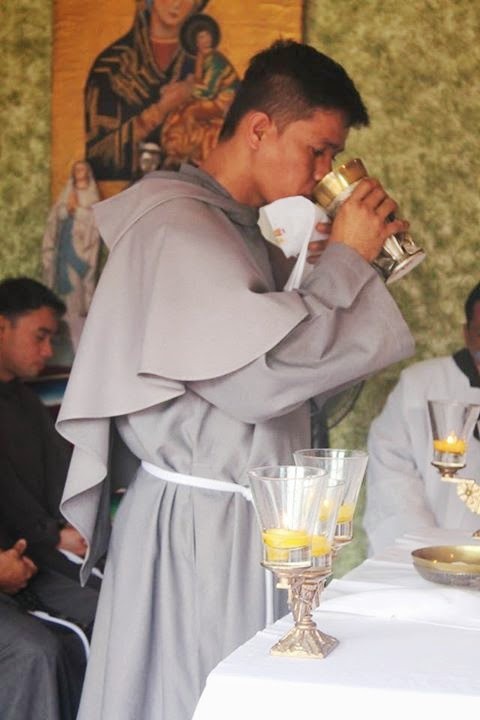 Kahit buhusan ng timba-timbang holy water yan hindi yan blessed. 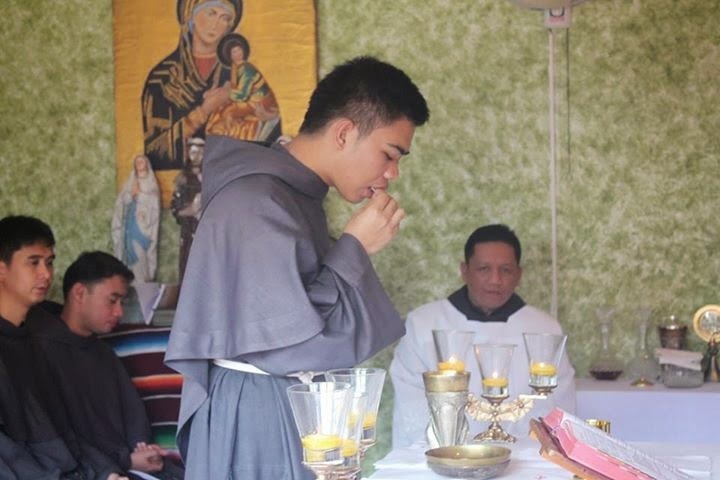 Sit down Mass na, Tablet Mass pa.
Kung ikaw ang nagsisimba dito, masasabi mo ba na ramdam mo ang over powering presence ni Lord? 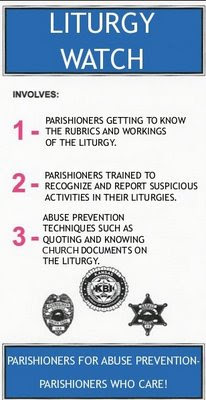 Accredited na ng Archdiocese of Manila ang Catholic Faith Defenders Manila. CONGRATULATIONS SA CFD MANILA! Mas nauna pa ma-accredit ang CFD Manila kesa sa ma matandang grupo. Nakapagtataka. Nagpahatid din ng congratulations ang number 1 fan ng blog na to! Pero sa likod ng galak ng author ng blog na ito ay galit. 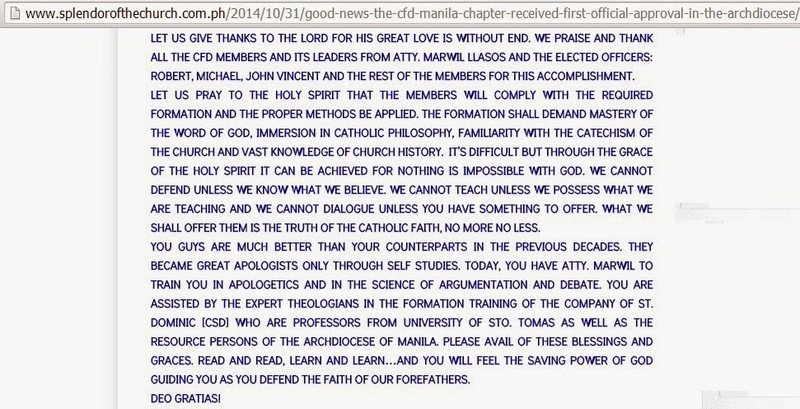 Hindi daw dialogue ang focus ng isang Apologetics group. Ano kaya? AWAY. 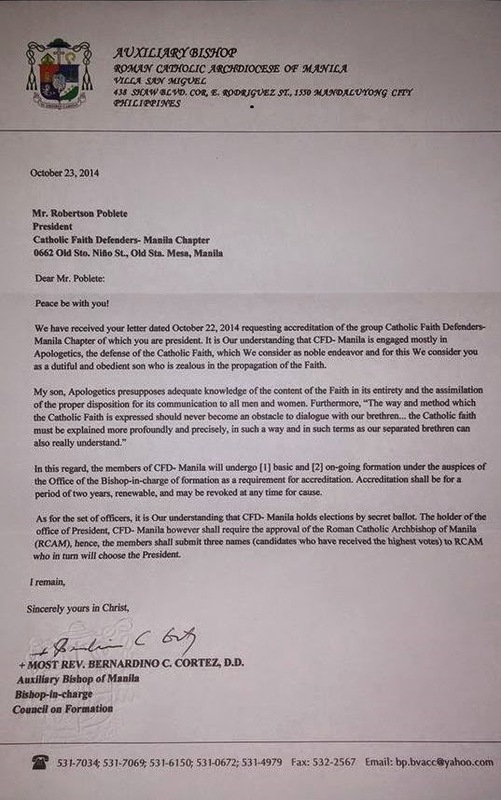 Pero ano ba ang bilin ng Archdiocese of Manila sa pamamagitan ni Bishop Cortez? In dealing with our separated brethren, we should not appear as bashing them or attacking their person. We should explain our faith gently and not to respond in a similar way with (sic) them...Not in a way that we bash and attack their person. Baka kaya hindi ma-accredit ang ibang Apologetics group dahil affiliated si Abby sa grupo na yun. Just thinking out aloud. Happy birthday Father. Pahinga ka muna kami muna ang mag papaka pari. Itaas ang kamay. 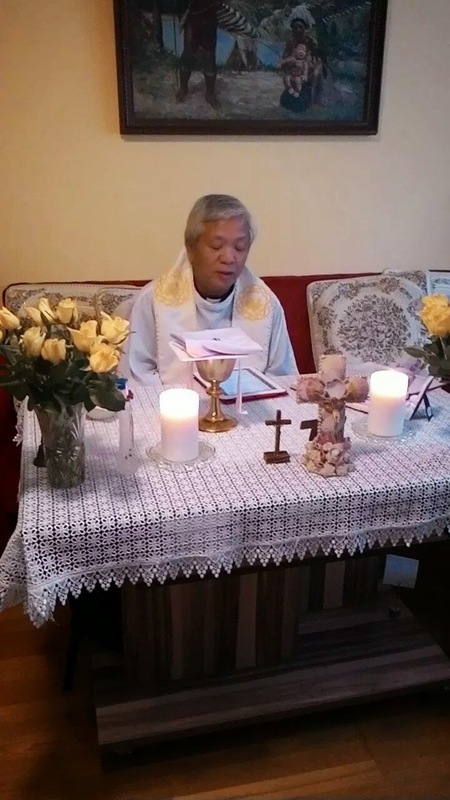 Pray over si Father. 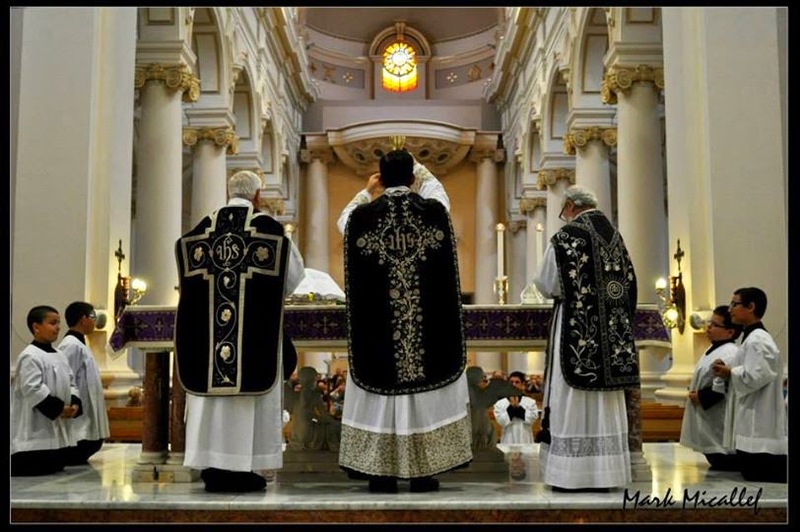 Contrary to the rants of the swivel-chair and hobbyist liturgists and ill-informed priests, BLACK is a liturgical color which the Church did not abolish. 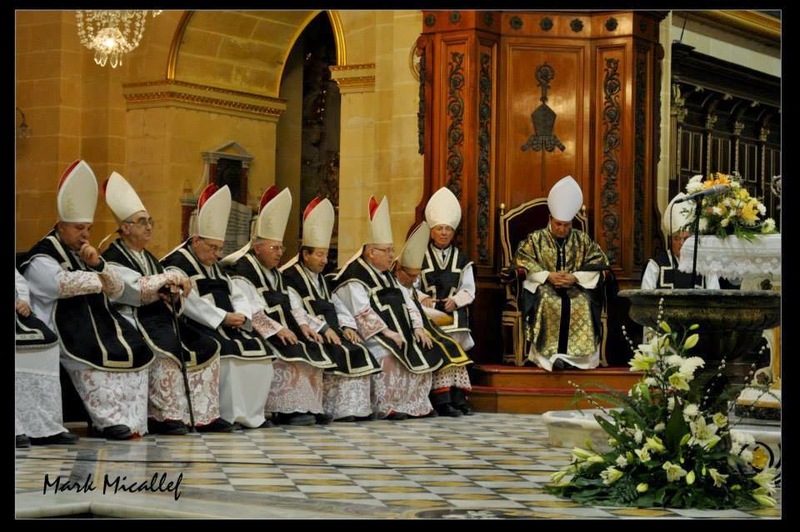 And here are some photos I got online, of bishops and priests celebrating the Mass of All Souls day in the Ordinary Form (Novus Ordo Missae) or the Missal of Blessed Paul VI, wearing black vestments. 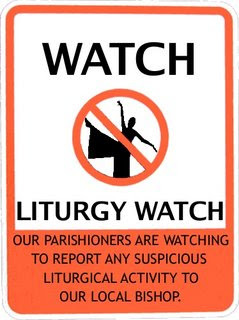 Because they do not teach seminarians to read the GIRM. What is happening to the Conventuals? At the Junior Friar's Annual Retreat. If this is taught to them, what can we expect them to be? A friendly reminder from 100%KP and shared to the readers of this blog. Watch the video and how the ABS-CBN reporter insinuates that after just a year in office, Pope Francis contributed to the increase in priestly ordinations in the country. Yes! For the reporter, it only takes a year to get ordained. And one other thing, the missionary priest celebrates Mass, on the floor! As if there are no tables. Their excuse "but that is how people in the barrios eat!" But is that the way Catholics celebrate Holy Mass? 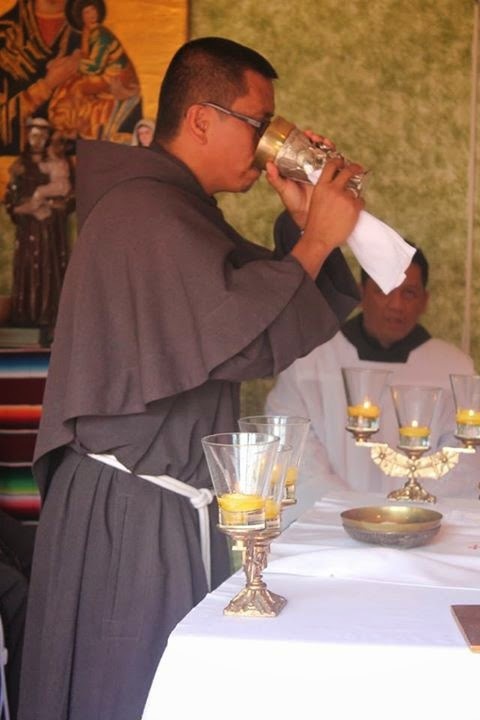 Liturgical Inculturation Trash! 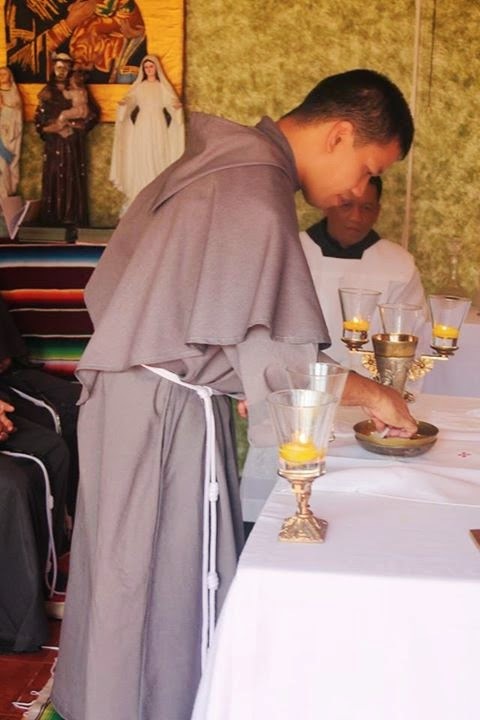 You treat the Holy Mass like you would treat an ordinary meal. Christ Himself instituted the Holy Mass during the celebration of the Jewish Passover Meal. Show me a Jewish Passover celebrated on the floor or inculturated! That is how you treat something holy? 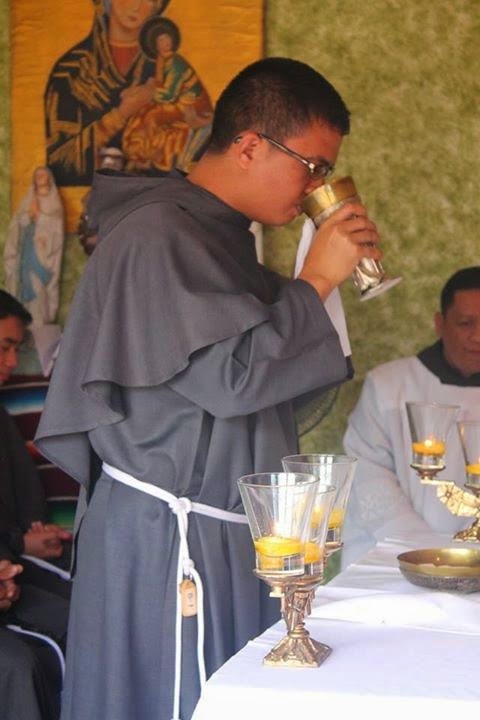 Can this priest or any of his friends defend their liturgical abuse? 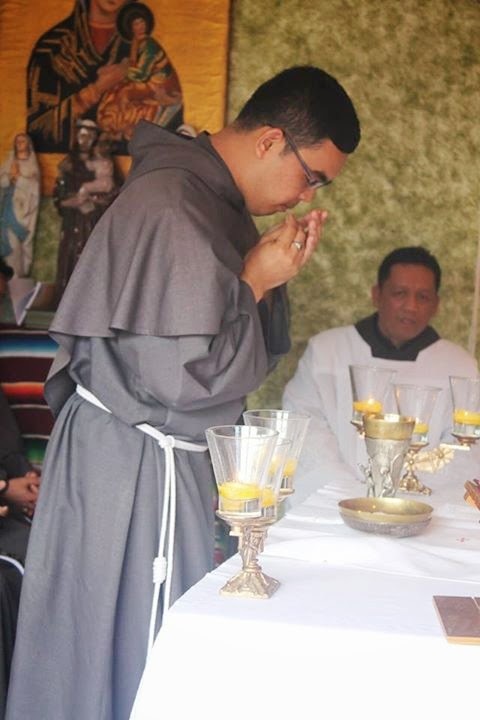 And the priest even mentioned that he was "evangelized" by the poor. Uhm... I've heard that before. The simplicity of the people can indeed bring you to realize what is important in life. But let us not forget this. 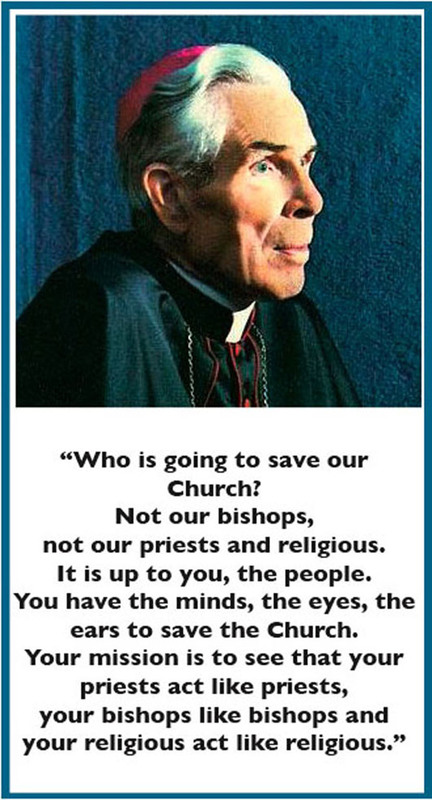 The real work of evangelization rests on the priest.